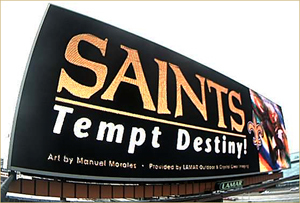 February 2, 2010: The Saints Tempt Destiny billboard is being featured on LAMAR Outdoor digital billboards located throughout the greater New Orleans area. As won by their fans at TemptDestiny.com, the Saints organization accepted this gift from their fans and approved the Saints Tempt Destiny billboard. The Saints fans cast 80,921 votes compared to the Colts fans 75,675 votes thereby winning the TD billboard in support of their team's SB XVIV bid on Sunday, February 7, 2010. This gift of support is being provided by Olympic artist, Manuel Morales, LAMAR Outdoor Advertising, and Crystal Clear Imaging. The history associated with the Morales billboards is that each time a Tempt Destiny billboard is created, the team depicted goes on to win the Super Bowl, a 3-for-3 track record. The Saints Tempt Destiny billboard marks the first time in the ten year history of this billboard competition that a Tempt Destiny billboard is determined by the team winning its conference championship without having the most overall votes. For the 2009 football season, the Vikings fans cast the most overall votes, however, their team did not win the conference championship game and so the next Tempt Destiny billboard goes to the Saints whose fans outvoted the Colts fans. For the first time ever, there will now be two distinctive categories of Tempt Destiny billboards, one of choice – as determined by the team with the most overall votes also winning its conference championship game (3-for-3 record), and one of chance – as determined by the team going to the SB with the most votes between the two competing teams. This change provides the opportunity to create a Tempt Destiny billboard each year beginning with SB XLIV. Since 2000, the results of the Tempt Destiny experiment shows that the team with the most votes that also won the SB (without a Tempt Destiny billboard), came to be 2 out of 8 teams. The results exclude the 2009 season, yet to be completed, and the 2007 season when the NY Giants won the TD billboard of choice. With the advent of the Saints Tempt Destiny billboard, a new track record will be establish pending the results of SB XVIV. During the ten year span of this event, only once did the TD billboard of choice occurred overcoming 1024 to 1 odds (32 fan choices X 32 team chances). The billboard was then created, and once again, destiny followed with another SB victory! It is hoped that the 3-for-3 winning track record will carry over in support of the New Orleans Saints first Super Bowl bid. What better team to beat the odds then the Saints, who have been called – the team of destiny. Lamar Advertising Company is a leading outdoor advertising company currently operating over 150 outdoor advertising companies in 44 states, Canada and Puerto Rico, logo businesses in 21 states and the province of Ontario, Canada and over 60 transit advertising franchises in the United States, Canada and Puerto Rico. Lamar Advertising operates more than 1,100 digital billboards across the U.S., more than any other outdoor company, allowing customers unparalleled flexibility to control their message as their advertising needs evolve. Manuel Morales' career has encompassed many facets of the art field from van murals* to book covers, editorial and advertising illustration as well as fine art paintings, original graphics and reproductions exhibited at galleries nationwide. He was one of a select group of artists commissioned to create artwork for the US Olympic Committee's Olympic Portfolio consisting of posters and limited edition prints to raise funds for TEAM USA. Visit web site. *Manuel Morales was featured in a "This Bud's For You" Budweiser commercial from 1984-1985 airbrushing a flying Clydesdale onto a van.